What do SAP, Trumpf, Würth and Mahle have in common besides being international, innovative market leaders in information technology or engineering? How are they associated with the interesting and inspiring educational Science Center Experimenta Heilbronn? To shape the digital world of tomorrow all institutions mentioned above are seeing the necessity of qualified people with deep insight in IT from communications to coding. Thus, they aim at strengthening technology education not only in vocational trainings in companies but all types of schools. This is why all these institutions became partners of the Wissensfabrik and support the new IT2school project. IT2school is a curriculum for all types of schools to support teachers to include IT topics into lessons for students aged 9-16. The project is designed in cooperation of Wissensfabrik member institutions such as SAP and provides insight in IT related topics. Students not only learn how to use IT but rather understand the underlying processes which enables them to independently shape the digital world. 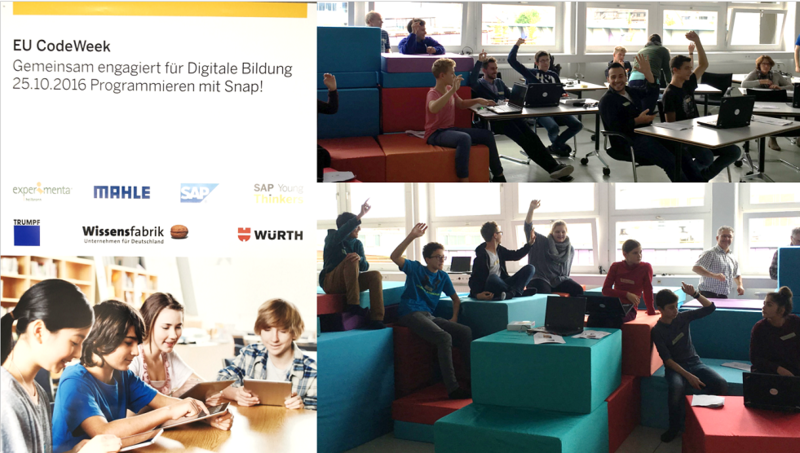 Sharing the same goals, the IT2school partners under the aegis of SAP’s Young Thinkers Network decided to offer a joint workshop within the EU Code Week to introduce coding with Snap!. This graphic programming language is convenient for both, programming beginners and advanced coders and creates excitement for coding in a fun and playful way. And where else can excitement be created than in an inspiring work atmosphere? 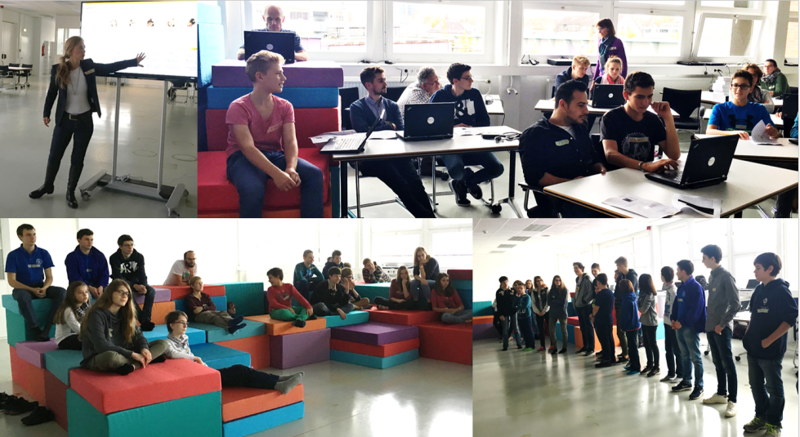 This motivational atmosphere was definitely present in the loft in Ludwigsburg, where company representatives came together with more than 50 students and teachers of their member schools. The loft’s big rainbow sofa area was immediately conquered by the students and invited everyone to creative learning and interactions. After each company gave a short but interesting insight into its field of interest and the company history, the workshop started with an easy warm-up. Students and teachers built tandems based on their previous programming knowledge to not only learn coding but also teaching and explaining at the same time. In a live coding tutorial, students and teachers learned how to create complicated movement patterns of their sprites with relatively simple code. Since hands-on experiences are necessary to internalize what you have learned, the tandem groups then experimented with Snap! on their own, creating loads of interesting movement patterns and gaming ideas. However, IT is not only about coding but also about understanding communication between devices or with the internet. Therefore, participants were invited to tinker with hardware and try out their code with the MocoMoco microcontroller. 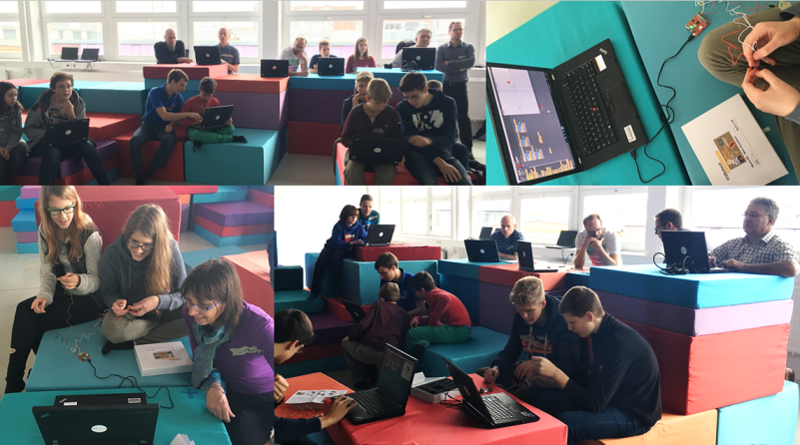 After 2 hours of intensive coding and tinkering, the workshops ended with overwhelmingly positive feedback, reflected in the words of a workshop participant: “We definitely need to repeat that at our school”. We are glad we could lay a technical foundation and spark enthusiasm for coding in students and teachers and are encouraged to continue our mission to bring IT experiences and knowledge to all Young Thinkers.